Today, in our on going look of who is really protesting the war, I am going to state a fact that the MSM is afraid to say: The Anti-War movement is quickly becoming an anti-troop movement. On campus, they call it "anti-recruiting" and it is focused on ROTC cadets, military personal at job fairs, and high school recruiting. They say "we support our troops, but we do not support recruiters." Guess what? Recruiters ARE troops! The consequence of this rhetoric is a collective slap in the face of military personal both home and abroad. They are saying that "signing up for the military is wrong" and "most enlistees are duped into it." What is that saying about our troops? The answer is simple: They are calling us stupid and ignorant!! In the late 1960s, during a period of growing student, black, and working-class militancy which eventually played a central role in defeating U.S. imperialism in Vietnam, protesters were able to shut down ROTC departments and make many campuses off-limits to recruiters. Today, we can draw from the lessons and experience of the Vietnam anti-war movement, and successfully kick military recruiters out of our schools. Anti-recruitment committees need to be organized at every high school and college. 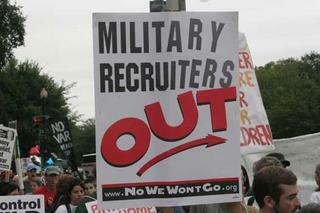 Already this fall, campaigns are emerging to kick military recruiters out of high schools and college campuses. Socialist Alternative is working to launch and build these campaigns in a number of schools. These structures can mobilize students to participate in informational pickets, educational forums, counter-recruitment protests, office occupations, and other events. Through these actions, we can send military recruiters packing with the message that working-class youth and youth of color will not fight and die for corporate profits and the U.S. empire. First, they claim responsibility for the loss of US lives in Vietnam. Then they are proud of kicking ROTC off of campuses. ROTC is a RIGHT for students. We have the same rights to pursuit a future in the military as the liberals have a right to pursuit a future in Women's Studies or LGBT Studies. 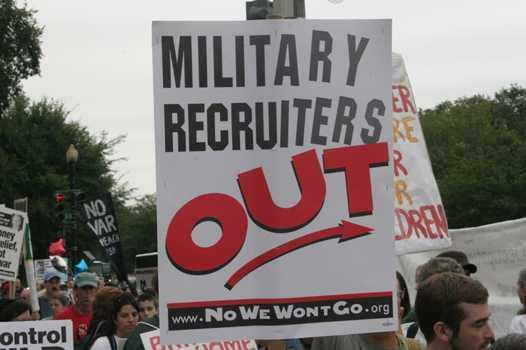 Now they want to prevent High Schoolers from making a decision to join the military! Folks, if you believe that recruiting for the military is wrong in High School and Colleges because these students are being tricked into service, then you are calling every soldier that has ever worn a uniform a moron. A Piece of advice to the anti-war troop haters out there: Your right to protest, to say these hateful things are protected and guaranteed by the very soldiers that you don't want to exist. Great piece. I just had this very debate with someone back home. I, of course, was pro-recruiting. I would expect as much Ryan. I think that is the strongest argument one can make for recruitment: "Your right to protest, to say these hateful things are protected and guaranteed by the very soldiers that you don't want to exist." True. These people are biting the hand that protects them. How would their protests go in Iran, North Korea, or China? Our constitution is only as strong as those willing to die for it. I wish they understood that. Dudes. Most soldiers are morons, or just terribly desperate. As are most people who blindly follow one ideology, party, leader, or religion. It ain't the liberals who feel that. Most of them are morons too. Read a little conservative philosophy: Nietzsche, Wittgenstein, Quine. Just listen to Rumsfeld and you'll understand what big-brains think about the pawns in the field.